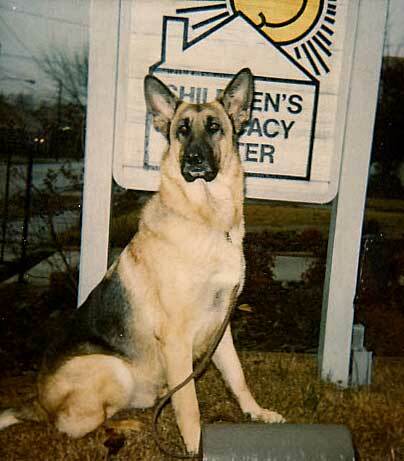 While the newspaper account that follows is accurate, as is often the case, there is more than one story as to how Vachss the German shepherd came to be an integral part of the Children's Advocacy Center. This part of the (whole) story may give more depth to the history of Vachss, and it may explain some of how he came to have the strength he displayed and the love he gave so freely throughout his life. When I first came up with the idea of using a "therapy dog" to work with abused children at the CAC in Mississippi, following the model established by our beloved Sheba, I turned to my brother, James Colbert who has been my partner on projects ranging from literary to much riskier ventures. Jim, an ex-Marine and former police officer, with a range of specialized skills too lengthy to list here, has a superb understanding of dogs, and of children in need of protection. After a long search, Jim found the perfect German Shepherd, and persuaded the breeder to part with him. Jim named him "Vachss"—one of the greatest honors ever bestowed upon me. It was Jim who brought Vachss to Jackson, Mississippi—in fact, Vachss made a TV appearance that same day, and was an instant star—explained the dog's mission to the Children's Advocacy Center, and then took him home to his farm in Louisiana, where he personally trained him for his work. Later, when Vachss—who grew into a huge example of his breed—became too much of a "handful" for local personnel, it was Jim who came and got him, and re-trained the big guy so that he could be handled by those with much less experience and physical strength than the original specs called for. Against everyone's advice, Jim allowed Vachss to run with Honey, reasoning that, if he could train the Shepherd to deal with the intrepid antics of a rambunctious pit bull pup, he would find dealing with anxious and unruly children a breeze. He was right. And then Jim took him back to Jackson, to personally work with those who would be handling Vachss on a daily basis. In all the ways that count, Vachss was Jim's dog. Jim picked him, Jim named him, Jim brought him home ... Jim loved him and trained him and cared for him. Vachss had his work, and he did it heroically, to the very end. But the man who raised him, the man who loved him enough to let him go and be a warrior for children, has not been acknowledged in the many media accounts that have since been generated. Vachss carries my name, but it was James Colbert who made all he achieved for children possible. Hero Dog of the Year 1994. Dog Comforts Abused Children in Court. 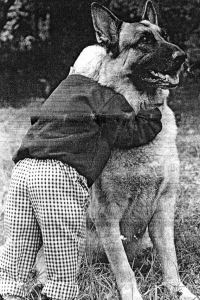 A good-natured German shepherd helps youngsters cope with facing those accused of sexual offenses. Read a transcript of Vachss in action during a trial. To the German Shepherd Dog Club of America, Vachss is Hero of the Year. To the abused children he helps, the 3-year-old German shepherd is a cuddly confidante who listens to their secrets and comforts them during courtroom appearances. Licensed and trained to work with children, the dog has escorted three children into the courtroom for their testimony against their accused sexual offenders. Vachss will be presented the Hero of the Year award Nov. 11 in Perry, Ga., for his work with the Mississippi Children's Advocacy Center. Sue Hathorn, executive director of the center and Vachss' guardian, said the dog has a genteel personality that makes children comfortable in and out of the courtroom. "He will just lie down on the porch and let the kids just wallow all over him. It may not be therapy, but it sure looks good to me," said Hathorn, who has run the nonprofit center on President Street since its inception in January 1990. "We as adults see a great big dog, but the children see a friend," Hathorn said. Vachss, from Covy-Tucker Hill Kennels in California, was donated to the center for therapy work with abused children by his namesake, Andrew Vachss, a New York City attorney who specializes in juvenile justice and child abuse cases. The attorney also writes novels based on child abuse cases he deals with daily. Patterned after a program in Huntsville, Ala., the Children's Advocacy Center is an outgrowth of the Mississippi Committee for the Prevention of Child Abuse, Hathorn said. The center focuses on interviewing and counseling abused children; the Committee for the Prevention of Child Abuse focuses on education. The third arm of the program, Children First, is made up of volunteers who represent children in court. Services at the center are free, with most funding coming from the Jackson-based Bingo Depot. "The center grew out of a need for education and prevention. As we grew and learned, we found that the children needed to be represented in court," Hathorn said. Hathorn said she'd heard of dogs being used as companions for the elderly and in youth detention centers in lessons on nurturing but wasn't familiar with dogs being used with abused children. In 1990, Andrew Vachss traveled to Jackson, promising a therapy dog and the support needed to get the newly formed center off the ground. Andrew Vachss could not be reached for comment. Leigh Johnson, director of the center, said the use of the dog is an anomaly in counseling child abuse victims in Mississippi. "We are the only facility that has a therapy dog to use when we want to. The main advantage is that most kids love animals, and most have never been hurt by an animal," Johnson said. "Vachss can't talk, so he can't tell their secrets. Because of Vachss' size, children feel protected," she said. Johnson said the dog helps lessen children's feelings of intimidation in the courtroom, where they often must look into the eyes of their alleged perpetrators. "Anytime a child is in the courtroom, they're facing the person they're accusing. There's intimidation there, even for us as adults," Johnson said. "This is an even more vulnerable situation for the children. Vachss gives them the comfort of a friend." Johnson turned down requests to interview children, saying she didn't want to compromise their pending court cases. "If I asked them to talk to you anonymously, they probably would agree. Most of them are natural-bom pleasers," Johnson said. "But most children who have been abused expect to be re-abused, so we go overboard to protect them with confidentiality for protective and legal reasons." The Clarion-Ledger does not publish the names of sexual assault victims. Vachss has worked with children ages 5 to 14, Johnson said. Vachss made his first courtroom appearance about four years ago when he sat at the feet of a 5-year-old girl in a preliminary hearing before Rankin County Judge Jim Smith. Smith, now a state Supreme Court justice, said the dog steeled the child's courage and helped her testify confidently. "We're not used to seeing children react like that in a courtroom situation," he said. "(Vachss) opens them up and helps the child testify in a very clear, forthright manner." Smith said he researched the legality of the procedure and followed the guidelines set down by the state of New York. "The dog has to be licensed and trained in this specific area, and the jury must not have any contact with the dog or actually see the dog," Smith said. "No one other than court officials knew the dog was sitting at the foot of the child," Smith said of the first and only time Vachss appeared in his courtroom. "He's really just a security blanket for the children. It's nothing new really; it's been done in many states," Smith said. "It's just a different approach, especially with a large animal like this." and New York, the latter of which has made the practice of using witness-comforting dogs a courtroom standard. And, now, Sheba and Vachss' legacy goes international! See latest from Canada.